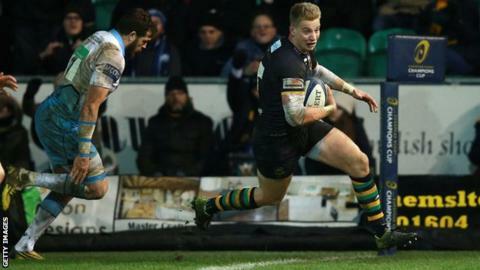 Harry Mallinder scored a late try to give Northampton victory over Glasgow and revive their hopes of making the European Champions Cup last eight. Teimana Harrison had shunted over from close in to give Saints the lead, but three Finn Russell penalties put Glasgow 9-7 up soon after the break. Christian Day's try restored Saints' lead but two more penalties saw Glasgow open a three-point advantage at 15-12. But Glasgow were reduced to 14 men and punished by Mallinder's late score. With Racing 92's 64-14 win over Scarlets earlier in the day securing the French side top spot in Pool Three, only Northampton can now gather enough points to qualify as one of the three best runners-up and progress to the last eight. Currently on 14 points in standings, Saints are likely to need 18 points at least to qualify and will be targeting a bonus point as well as victory when they travel to Scarlets next weekend. Glasgow might well have been in the running for the last eight had replacement lock Tim Swinson not thrown a punch late on to earn a yellow card. Down to 14 men, their previously comfortable defence began to creak and Stephen Myler's high crossfield kick was knocked down into 19-year-old Mallinder's hands by George North to ensure the Warriors will fall short of the knock-out stages. Northampton made heavy weather of their win and will need to show more cohesion in attack and aggression in defence if they are to be involved with the latter stages of the tournament. While JJ Hanrahan was inconsistent at fly-half, replacement Stephen Myler provided a composed platform for his side's late push for a winning try. Mallinder's performance on his European debut - as a replacement for injured wing Tom Collins - was another highlight as he attacked with energy and pace. Northampton: Foden, Collins, G. Pisi, Burrell, North, Hanrahan, L. Dickson, A. Waller, Hartley, Hill, Lawes, C. Day, Gibson, Wood, Harrison. Replacements: Mallinder for Collins (25), Myler for Hanrahan (53), Kessell for L. Dickson (74), E. Waller for A. Waller (63), Haywood for Hartley (56), Denman for Hill (72), Fisher for Harrison (56). Glasgow: Hogg, Jones, Dunbar, Johnson, Lamont, Russell, Price; Reid, MacArthur, Puafisi, Nakarawa, Gray, Wilson, Fusaro, Ashe.